It's shaped like a sword. Because that's how formations work. We will only be beaten if Atletico form a rock. We will beat them if they form paper tho. Last edited by DRvad14 on Thu Jun 29, 2017 11:44 am, edited 1 time in total. I can't find an answer I need - when i click on Create inquiry it takes me to this next page where my credit card is listed. So how this works - do they take funds from your account later (if you are selected) or they reserve the money now? I guess they take money from your account if you are selected, it should be working as the UEFA Supercup lottery I entered (when you enter the lottery funds will be taken from your account if you are selected). So Rudiger is about to go to Chelsea from Roma for 40m. One year ago they bought him for 9m. SilentStrike wrote: So Rudiger is about to go to Chelsea from Roma for 40m. One year ago they bought him for 9m. 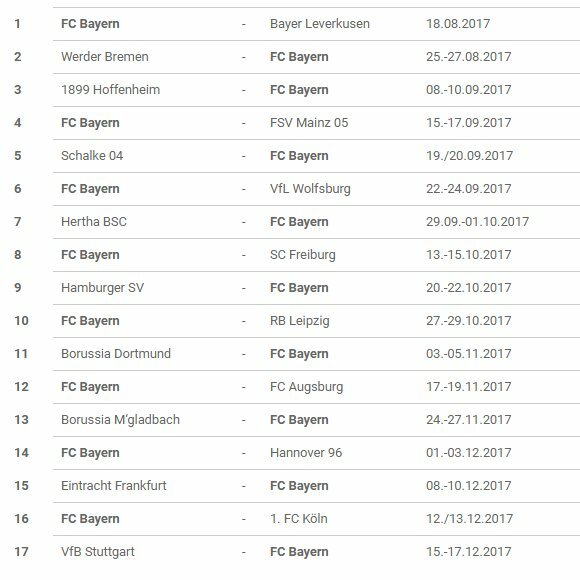 As much as I'd love to see Bayern win the BL again. I think CL should be the priority for the upcoming season. Which means not risking key players before crucial CL games. The example of Lewandowski against Dortmund before the QF home leg against Madrid comes to mind. In the upcoming season risks like that should be avoided and winning the European Cup must be the utmost priority. Hopefully come April/May we'll be in all three competitions and then see how it goes.